Have your answer ready, you're going to get a lot of requests for this one - it's a kid-magnet. You can use the "still adjusting to the altitude" excuse for a day or two, then it's time to hit the gym. See who's up for a soak after dinner - there's a jacuzzi right on your balcony. Clear the dishes and get cracking on that 1,500-piece puzzle you brought, or face off over Connect Four. Steel beams and dry-stack stone accents give it a modern-rustic vibe. You won't have to go far to enjoy the slopes. Red Pine Gondola at Canyons Resort is just a 6 minute drive away. Nearby Newpark Town Center features a variety of spa treatments. Lace up your hikers, Round Valley Trailhead is an 11 minute drive from the resort. Work on perfecting your swing at Lenwild Golf Club, a 10 minute drive away. 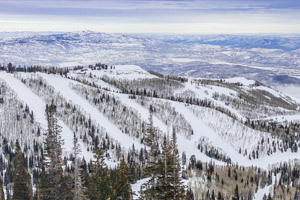 Located at the edge of the 1,200 acre Swaner Nature Preserve, the modern-rustic Newpark resort is just minutes from The Canyons, Park City and Deer Valley. So no matter where you’re skiing, tubing, hiking or biking, it’s an easy drive to the slopes or trails. Promise the kids a trip to the indoor/outdoor pool, and clock your family pool-gear-gathering time. (You may just beat your all-time record.) Kids can’t seem to get enough of the swim-under to the outdoor part, and there’s even a shallow area for the little ones. You’ll find a lap lane for knocking out a cardio workout, or you can hit the onsite gym. The fitness center is well appointed with ellipticals, treadmills and stationary bikes, if you’ve got anything left after conquering the mountain. Feeling like you’ve earned a spa day? Make a beeline for nearby Newpark Town Center. Afterward, check out the dining scene and make an executive decision to postpone those top-your-own-tacos and leave tonight’s feast to the pros. Spacious studios and one-bedroom condos sleep up to four weary mountain tamers. And two-bedroom condos and townhomes sleep either six or eight. All condos have wet bars or full kitchens, complete with Keurig coffee makers. That said, room service from nearby Kneader’s Bakery & Cafe has your back. Relax in front of the gas fireplace with a good book or cup of coffee. 32˝ TVs and DVD players are perfect for family movie night. Rally the troops, pop some popcorn and request a show of hands: The Lego Movie or Wreck-It Ralph? Bathrooms offer luxe touches like heated floors, plush robes and premium amenities. Housekeeping is provided daily (or every third day for townhomes), which means you’re off the hook. Studio, One-, and two-bedroom condos and two-bedroom townhomes feature private decks with hot tubs, perfect for re-telling (in great detail) the days’ most epic wipeouts while admiring the gorgeous mountain views. The resort is adjacent to Newpark Town Center, the only LEED-certified land development in Utah. The all-you-can-eat french toast at Kneader’s Bakery & Cafe is a can’t-miss. (We repeat: all-you-can-eat french toast.) For dinner, appoint a tiebreaker to make the final call: Jumbo Lump Maryland Crab Cakes at Myrtle Rose. Traditional Mexican dishes at Rio Grande. Or homemade ravioli at Maxwell’s. Check out the spa scene, or visit the Utah Olympic Park – it’s directly across the street from the resort and open year-round. Activities include Comet Bobsled, Extreme Zipline, Discovery Adventure Course and a scenic chairlift ride. Be sure to save a day for downtown Park City as well – there’s a free shuttle from Newpark. Located 8 miles from Park City, Utah. Built for the 2002 Winter Olympics. It's a training center for Olympic and development-level athletes. Olympic Park's defining activity during the summer and winter is the Comet Bobsled ride.